Darkness had fallen gently across Luxor, and we had a night train still to catch. Time was slipping like sand through our fingers and Muhammed was still dragging us here and there. Once more to his house for tea, so he could change clothes for his 'cousin's' wedding taking place, just down the road. A 2 minute visit there and we then 'had to go' for tea at his 'just discovered' cousins cafe on the Nile, where we looked out upon this wonderful scene from the rooftop. I could see that we were going to be late so prodded and pushed and gulped tea and got us to the ferry landing. The boat of course was on the other side so we had to pay a private boatman to get us across to Luxor. 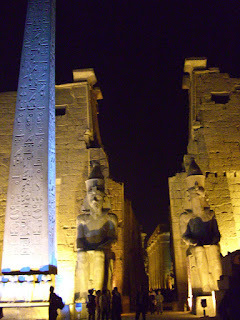 By this time there was only time to dash across the grounds of the Luxor temple. I stopped only long enough to take this one picture, and then we ran for our lives to collect our bags at the hotel. Muhammed faithfully stayed with us until the train came up to the platform. He said, that even at that late hour he was going off to give English lessons, and not go to his cousin's wedding. I asked him to demonstrate how he taught. He could not get enthusiastic about this. He was more interested in talking, once again, about getting married. I hope it happens, soon. 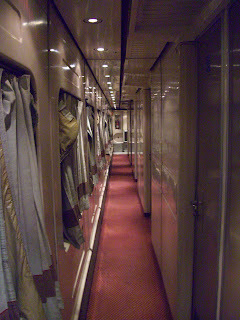 The sleeper train to Cairo is another world altogether from the so called 'first class cars.' There are something like real beds and they serve a meal of sorts at night and breakfast in the morning. There are real doors to the room, and clean sheets on the bunk beds which are pulled out by the porter. When you are locked into a rolling train slowly rocking back and forth as it pushes steadily along through the night. You have lots of time for gentle contemplation. I recalled experiences that had taken place 20 years ago in my previous visit to Luxor. There had been one memorable event then, that I hoped to recreate. Climbing over the mountains to visit the Valley of Kings by hiking there, instead of driving. There is a view of the Nile, from far above, that is breath taking. You are high enough up, that as you gaze down, the river looks like a slender green fertile thread, stretching from one horizon to the other. Around it spreads the infinite expanse of the light brown desert. Somehow we ran out of time to do it. But late at night as I fought for sleep it seemed okay. I slowly accepted the reality that reenacting old experiences is completely unnecessary when instead you have the opportunity for significant and powerful new ones. I think though that I wanted the boys to have a chance for that same unique opportunity that I once had, and well cups of tea, and playful kids just took more precedence. Our porter was just the perfect guy for the job. He never skulked around looking for a handout. He did his job well and smiled sincerely. I gave him a nice tip. This is how Mario and Rastia, my two young Slovak traveling companions looked, after spilling out of the train, early the next day in Cairo. I am not sure how I looked, but it certainly wasn't that good. I had been emailing them before our trip, suggesting that when I finally met up with them in Egypt, we should just get out of Cairo, and see a different side of the country. I suggested to them, that we go to visit Luxor. I am so glad we did. It was for me, the best part of the whole month long journey. I am not certain, what this picture reveals. My guess, is that this picture says, that they too will have strong sweet memories of Egypt. Ones that will also last 20 years, and maybe even a little longer.